Finca Bellavista is just the sort of place that Ewoks might go on vacation. 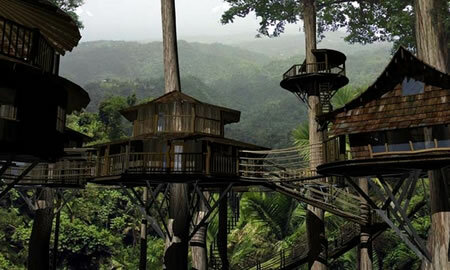 A sustainable rainforest community built 150 feet high in the trees, with connected paths. This cozy little development property located just six miles from Golfo Dulce, Costa Rica, is not accessible by road. They're working on a Sky Trail. Transportation here is a little different... you can't drive a car in and out to your treehouse. So that involved some creativity and technology as well. The two main forms of transportation within Finca Bellavista will be through a Sky Trail network of ziplines and platforms, and a ground trail network. The ziplines provide an invigorating commute in and out of the jungle, for sure. Getting the cables and platforms up has been challenging, but once they are all in, it will make access in and out of forest much easier (and fun). Oh, and they've got site-wide wi-fi, solar power, and other sustainable community features. But let's not forget those little Ewoks, secluded in a remote corner of the Outer Rim Territories, on a humble jungle moon circling the gas giant Endor. If you want to stretch your imagination with regard to the whole idea of a "tree house," be sure to read about Jack Vance's house trees from his 1954 novel The Houses of Iszm. Not to mention the Fab Tree Hab and the Treetents. Thanks to Vik for pointing this one out; from Bellavista's Biodigesting Treehouses.